As if God hasn’t made it apparent enough about us waiting to have children, the topic at our Annual Christmas luncheon at church drove home the point even more. While I was at my Wednesday night bible study at church a few weeks ago, the pamphlet below was on the table. And yes, the topic was waiting! 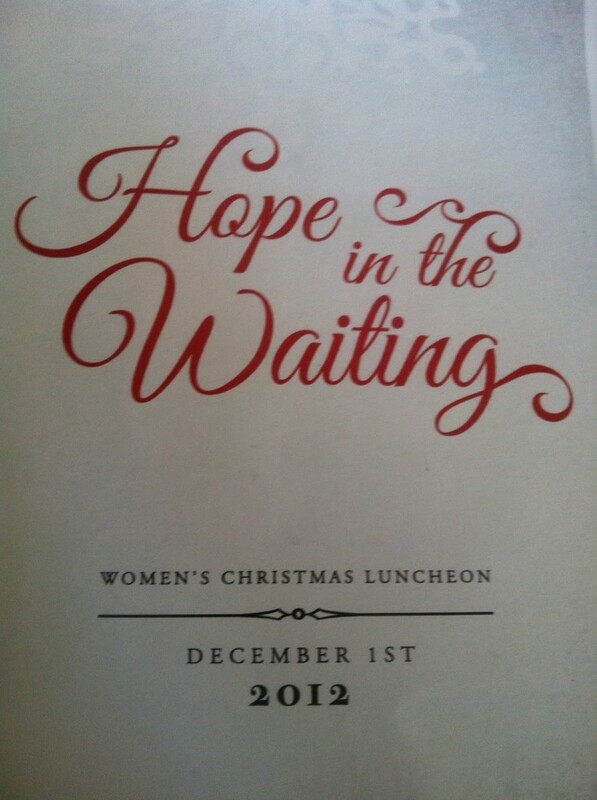 The luncheon was this past weekend and it was a wonderful time to celebrate Christmas and to hear Kat Armstrong speak. I find it interesting that the passage she covered, Romans 8:22-28, had to deal with childbirth. We know that the whole creation has been groaning as in the pains of childbirth right up to the present time. 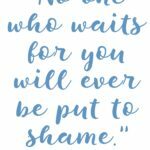 Not only so, but we ourselves, who have the first fruits of the Spirit, groan inwardly as we wait eagerly for our adoption to sonship, the redemption of our bodies. For in this hope we were saved. But hope that is seen is no hope at all. Who hopes for what they already have? But if we hope for what we do not yet have, we wait for it patiently. In the same way, the Spirit helps us in our weakness. We do not know what we ought to pray for, but the Spirit himself intercedes for us through wordless groans. And he who searches our hearts knows the mind of the Spirit, because the Spirit intercedes for God’s people in accordance with the will of God. And we know that in all things God works for the good of those who love him, who have been called according to his purpose. 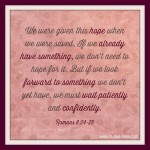 So, where do we find hope while we wait? Paul points out four things about waiting in the verse above. 1 – Jesus is coming back. – What great news! We don’t have to see the world as it is – broken and infected with sin. We have hope for future glory. There will be a new heaven and new earth. There will be no more pain, suffering, infertility, crime, tears, pain. We can cling to the hope when Jesus will return that our trials will be no longer. While we wait, we should place our confidence in God’s goodness and wisdom. 2 – God causes all things to work together for our good. Sometimes we don’t understand when we are going through a situation, but isn’t it always true when we look back, we can see God’s hand every step of the way? Because we live in a fallen world, this doesn’t mean that all things that happens to us are good, but it does mean God is able to turn every circumstance around for our long range good. He doesn’t work to make us happy, but instead to fulfill His purpose. 3 – We can groan as we wait. Paul mentions in the passage above that hope is like the groaning of a woman in labor (again, interesting analogy, based on our current trial). We as Christians can groan as we wait for Jesus to return and we can groan as we wait for our prayers to be answered. God welcomes are groaning. He groans with us and He knows the things we are waiting for are a big deal. 4 – Hope involves weak prayers. When we are weak, God intercedes and we are filled with the holy spirit. When we come across times where we are at the bottom and feel speechless, that is ok, because the spirit intercedes. We can pray speechless prayers when we feel as we are out of words to say. This is how I felt the night we got CJ’s first SA back. I remember not having any words. Not even knowing what to ask or say. But, as Romans says, God helps us to pray! Christian hope is in knowing that Jesus is coming back and He brings with him a new place with no waiting. It will be clear at that point that He was working all things for our good. 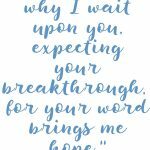 But, while we are wait here on earth, we need to ask God to give us eagerness, perseverance, and to fill us with prayers as we give Him glory during our trial. Oh how I shudder to think about where I’d be without my hope! Hope in Christ has been so restoring for us over these past few years. What a blessing it is! I think this is so true! There are so many times that I just lost it and had nothing to do but rely on God. I knew that every tear I had…he way there crying along with me. Kat did such a wonderful job at the luncheon. I love your summary, how can we hope for the things we can already see? We hope for things that we do not yet see. THanks for the reminder of the Hope we have in our Lord Jesus Christ!